This salad, with fresh leaves, creamy goat's cheese and fine-textured lentils, makes a substantial lunch, or halve the amounts and serve as a starter. Preheat the grill to high. Place the whole peppers on a baking sheet and place under the grill. Cook until the skins are blackened, turning occasionally. To remove the skins easily, place the hot peppers in a clean plastic food bag and seal immediately until cool enough to handle. Remove and peel the skins. Cut off the tops, deseed and cut into bite-sized pieces. Cook the lentils according to the pack instructions for about 15-20 minutes, until just tender. Drain, return to the pan and cover to keep warm. Meanwhile, heat 1 tablespoon of the oil in a frying pan and fry the onion for 4-5 minutes until softened. Remove from the heat and stir in the peppers. Whisk together the remaining oil, vinegar, lemon juice and mustard and season well. Stir the onion and peppers into the lentils and pour the dressing over. 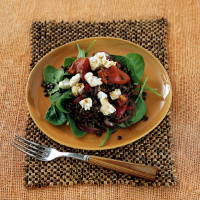 Arrange the spinach between 4 plates, spoon over the lentils and top each serving with a little goat's cheese. Serve immediately. The peppers can be prepared the day before; alternatively, use half a jar of Cooks' Ingredients Grilled Peppers. Drain before use. Goat's cheese and spinach both go really well with Sauvignon Blanc. Choose one from the Loire that is fresh and not too pungent, such as Waitrose Touraine Sauvignon Blanc.